What is now the Ghost Town of View Cove on Dall Island, Alaska, located in South Eastern Alaska, about 45 miles west of Ketchikan, and about 6 miles southwest of Hydaburg, which is located on Prince of Wales Island. View Cove operated as a limestone quarry camp where crushed limestone was quarried and shipped to Seattle, WA where it was made into Portland Cement. 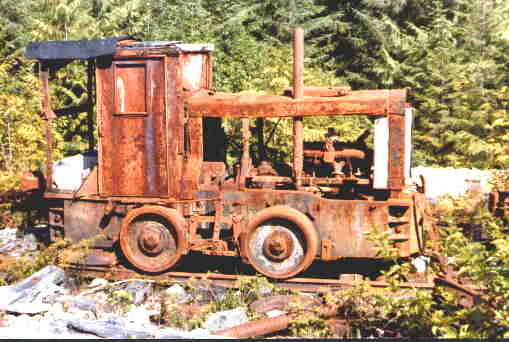 It operated a an active quarry from about 1928 to about 1942 when it was shut down because of World War II. 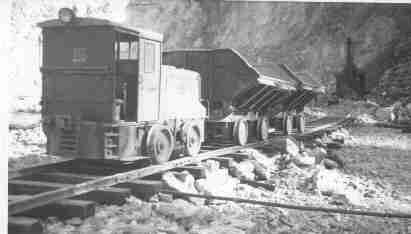 One of the two gasoline powered locomotives used to haul rocks from the quarry to te crusher. My brother, Melvin Kjonaas drove one of these locomotives during the summers of 1937 and 1938. The steam shovel can bee seen in the background. How one of the two locomotives looked in 1985. The locomotives had the name "Plymouth" cast into the frames. They were built before the Chrysler Motor Co. started using the name Plymouth on cars. I think the locomotives were manufactured by a Plymouth Locomotive Co.